Struggling to find cost effective flash storage for your primary, secondary, and backup/DR workloads? The HPE Nimble Storage Adaptive Flash Arrays are like having two flash arrays in one. The array is truly adaptive – designed for both primary and secondary flash workloads. It is a hybrid flash array for mixed, primary workloads where cost-efficient flash performance is important. It can also serve as a secondary flash array for backup and disaster recover (DR) while allowing you to put your backup data to work. The flash-enhanced architecture is combined with HPE InfoSight predictive analytics for fast, reliable access to data and 99.9999% guaranteed availability. Radically simple to deploy and use, the arrays are cloud-ready – providing data mobility to the cloud through HPE Cloud Volumes. Your storage investment made today will support you well into the future, thanks to our technology and business-model innovations. 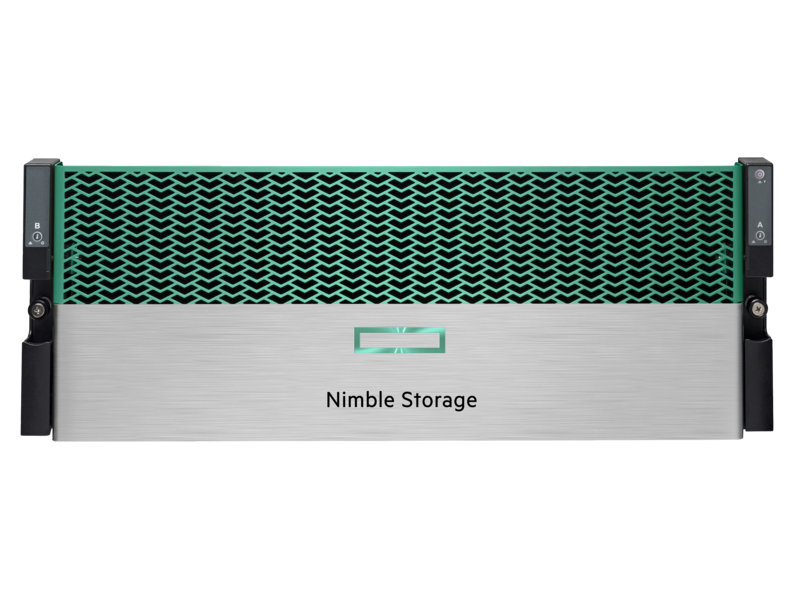 HPE Nimble Storage HF40C array and HF60C array provide higher effective capacity for workloads not requiring deduplication. Inline variable block deduplication and compression for increased data reduction. Performance up to 65% or more faster than previous HPE Nimble Storage Adaptive arrays. Up to 200% or more price-performance improvement than previous HPE Nimble Storage Adaptive Flash arrays. Secondary flash storage functionality for backup and disaster recovery (DR) workloads. The HPE Nimble Storage Adaptive Flash arrays automatically predicts and resolves 86% of problems before you even know there is an issue. Transforms the support experience through predictive automation and Level 3- only support. Holistic view across the infrastructure stack and resolves problems beyond just storage. Simplifies planning with prescriptive forecasts into capacity, performance, and bandwidth requirements. Makes infrastructure smarter and more reliable by learning from the installed base. HPE Nimble Storage Adaptive Flash Arrays are simple to deploy configure and manage. Deploy flash on-premise, or in the public cloud through common data services across the HPE Nimble Storage family. Seamlessly migrate data between all-flash, hybrid-flash, and multi-cloud storage. Our timeless storage is your assurance of business value, no worries today, no worries tomorrow. Radically easy to integrate with many ecosystems and has deep integration with VMware®, Microsoft® applications, Oracle®, Veeam, and others. HPE Nimble Storage Adaptive Flash Arrays have secondary storage that does real work: flash performance lets you use your backup data for development/test, QA, analytics, and more. Reduces the need for full backups since native application-consistent snapshots and replication plus integration with leading backup software. Speeds synthetic full backups from hours to minutes. 99.9999% (six-nines) guaranteed availability. Triple+ Parity RAID tolerates 3 simultaneous drive failures plus additional protection through intra-drive parity. Application-granular, FIPS-certified encryption provides secure over-the-wire protection. Enhanced data shredding is built-in. Built-in application-consistent snapshots and replication. Integration with leading backup software. Deep integration with Veeam availability software. Maximum drives per enclosure 21 HDDs (11 HDDs for HF20CH) and Flash Cache per HF-Series base array plus HF-Series Expansion Shelf. Availability features Triple+ Parity RAID for data protection (Triple drive parity plus intra-drive parity). 99.9999% guaranteed availability. Redundant HW/SW design - no single points of failure. Download HPE Nimble Storage Adaptive Flash Arrays Datasheet (PDF). This site is not owned or managed by HPE Nimble Storage. HybridSANWorks.com is a division of Virtual Graffiti Inc, an authorized HPE Nimble Storage Partner.